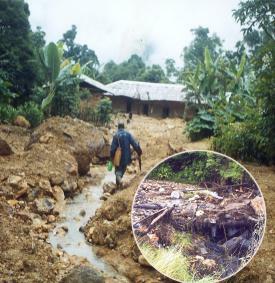 In June and July 2003, a series of important landslides happened in the Monts Bamboutos (western Cameroon) and in their surroundings, causing a large number of casualities and leaving many people homeless. Action engaged under mandate of the Canadian Space Agency on October 20, 2003. 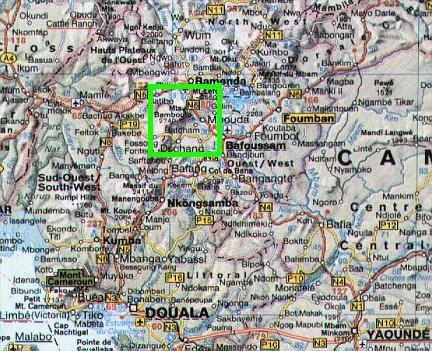 This database forms the base of a regional Geographic Information System (GIS), in order to spatialize all the related information collected. This delivery has been done timely, before the rain season of 2004, which is when a new series of landslides occurred. End of Canadian Space Agency / ParBleu project on February 28, 2004. 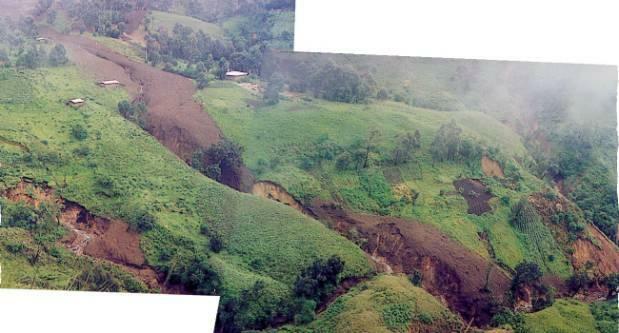 In May 2004, the integration and analysis of a TERRA-ASTER image acquired on March 08, 2004 contributed to the identification of landslides risks for the next rain season, in the summer 2004. Results: no more casualities in the monitored area in 2004, 2005 and 2006.
and at a spatial resolution of 30x30 meters and/or 15x15 meters. (under Pilot Project granted by the Joint Research Center of the EU). Courtesy of the University of Maryland, Global Land Cover Facility (URL: http://glcf.umiacs.umd.edu).